Heart Carabiner Keychain, Custom Engraved at Wholesale-Carabiners.com! Our patented Heart Shaped Carabiner keychain can be custom engraved as a giveaway for anything from cardiac specialist's office to a Valentine's day party. Versatile and 100% anodized aluminum, this item is sure to win you over. US Patent Pending. 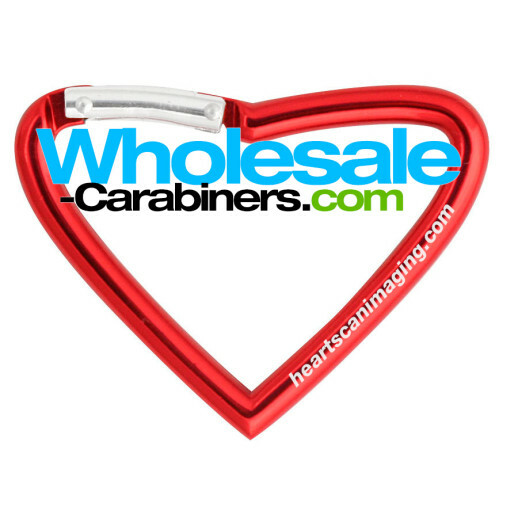 Our heart shaped custom carabiner comes with laser engraving included in the low price, featuring unbeatable pricing and a sleek, rugged and bright anodized aluminum finish! Not "bent", they are precision molded, providing the detail, precise curves and shapes that only true molding can deliver. Our precision molded carabiner keychains are 1st quality — they are 100% series-6000 anodized aluminum, providing a safe, tough, rich bright color and finish, and they are permanently and crisply YAG Laser engraved at no extra charge, as opposed to silk screened which is prone to flaking.